Are you deeply concerned about religion, not simply as a devout soul, but to the point of being frantic? Are little, inconsequential things the occasion of losing your peace of mind? Do you feel as though you need to repeat what has already been sufficiently done, such as a confession? If so, you’re likely suffering from scrupulosity. What is scrupulosity? In psychological terminology, it is Obsessive Compulsive Disorder (O.C.D.) directed toward religious matters. To use religious terminology, it can be defined as an uneasy and persistent concern that things might be sinful when in fact they are not. Some of the greatest saints of the Church suffered at times from bouts of scrupulosity, saints such as Ignatius of Loyola (1491-1556), Francis de Sales (1567-1622), Jane de Chantal (1572-1641), Alphonsus Liguori (1696-1787), Thérèse of Lisieux (1873-1897), and Katharine Drexel (1858-1955). Far from being taken as insurmountable obstacles, these saints emerged from their scruples into the clarity of God’s truth and merciful love in His Catholic Church. 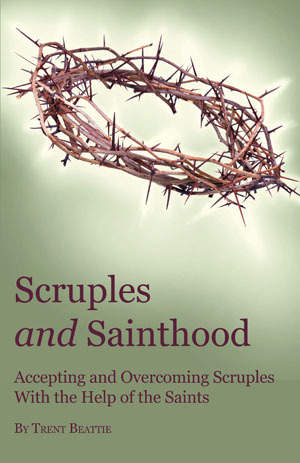 This book is meant to help scrupulous souls better understand and effectively battle their spiritual difficulties by uniting themselves with Our Lord, through the Blessed Virgin Mary in the Catholic Church. This is done by presenting the clear and simple teachings of the Church on matters relevant to the scrupulous, with emphasis on the writings of great saints. No obstacle is too difficult to overcome for one who prayerfully trusts in God, and this includes the problem of scrupulosity. This worry over the state of external things is directly related to worry over the state of one’s own soul. While it is true that God calls us to perfection, He does not expect us to be flawless immediately. Christian perfection is the work (first and foremost of God) of a lifetime, and is completed when we reach Heaven. Instead of wanting utterly comprehensive and flawless confessions, perfectly enunciated prayers, or even no hair out of place on our heads, God really wants our love. He wants us to love Him above all else, and to love our neighbor for the love of Him. When asked what the greatest commandment is, Our Lord declared “Thou shalt love the Lord thy God with thy whole heart and with thy whole soul and with thy whole mind. This is the greatest and the first commandment. And the second is like this: Thou shalt love thy neighbor as thyself” (Mt. 22:37-39). By Heidi Bratton, children’s author, Catholic family life columnist, and author of Homegrown Faith, Nurturing Your Catholic Family.